It’s safe to say that we tend not to associate outlet malls with good design and architecture. But as Lukstudio shows in Yioulai Shanghai Village – an outpost of the Value Retail giant – this can sometimes be an unwarranted prejudice. The Modular Lilong project is designed to showcase Chuang x Yi, a concept brand that is meant to champion Chinese fashion designers. 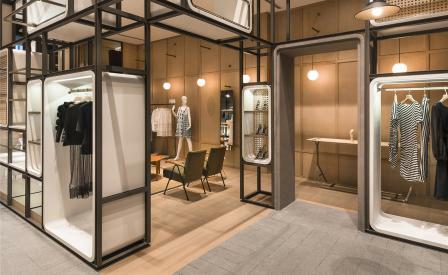 Rather than take the easy way out and simply hang the clothes on racks and display the accessories in quotidian cases, Lukstudio has based its layout on a stylised take on an urban setting. Here, the meandering laneways, houses, courtyards and entrances that make up a village are re-interpreted by carefully placed modular units that create a waiting lounge, two dressing rooms, a cashier counter and service area. The conceit is particularly effective when viewed from a slight distance, when the whole morphs, likes clouds in the sky, into an x-ray vision of an urban laneway stacked with houses whose internal courtyards and ‘street’ are marked by stone tiles and timber floor planks. Squint and it becomes apparent that copper coated racks bear the palimpsest of washing lines, while display plinths evoke neighbourhood benches and stools.